Hello, I have a question to "Rescue Line 3.5.4"
When a robot reaches a checkpoint tile. When will I get checkpoint scores? you will get the checkpoint score nearly in case (B) (and therefore especially (C)). 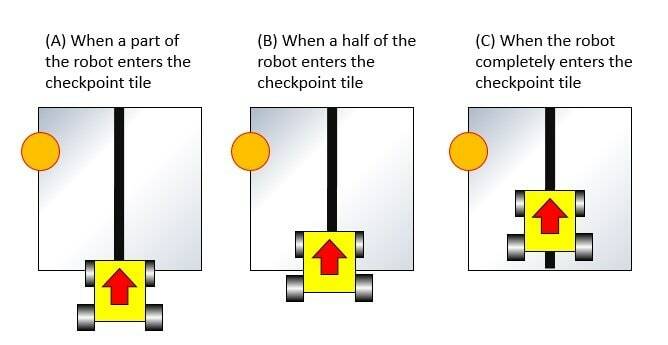 "Reached checkpoint" is defined as "more than half of the robot is within the tile marked with a checkpoint marker, when seen from above. ". The definition is the same as already stated in the Maze rules. We noticed this lack of definition and will write it on our list to improve in the rules for next year. Sorry for confusion! I understand that it is the same as already stated in the Maze rules.